The Arctic is in the EU. But that is not the only reason Brussels believes it has a role to play in the region. Representatives from the European Commission, the EU’s executive branch, take the main stage of Arctic Circle, a major conference being held in Reykjavík, Iceland through Sunday. Europeans are no stranger to the meeting: In addition to the Finns and Swedes — whose countries allow the EU to stake an Arctic claim — Brits, Danes, Germans, Poles and others regularly show up in numbers. This year, Italy organized a session explaining its activities the region. Yet, even as its member states have actively sought to associate themselves with the Arctic, the EU has, until now, chosen to keep its distance from its biggest event, figuratively, as well as literally: Karmenu Vella, the EU maritime affairs commissioner, delivered a video address during the gathering’s opening session, last year, but by video. 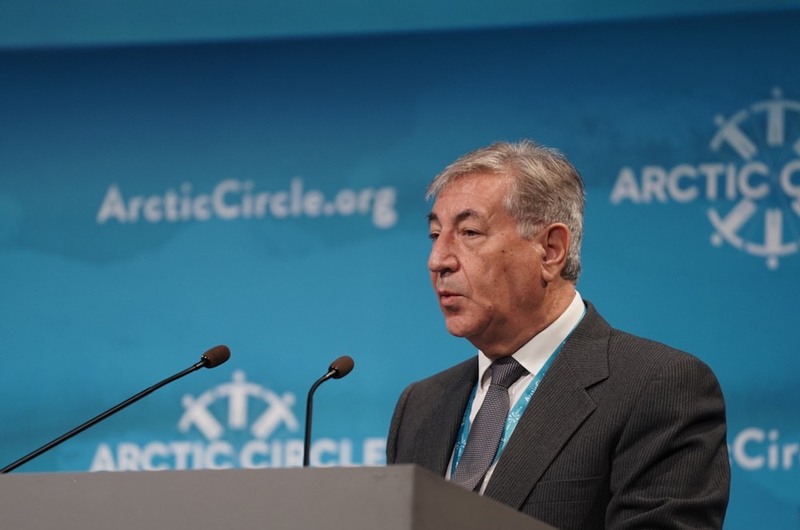 This year, Vella was on hand in the flesh, speaking to the assembly during the opening session, sandwiched between representatives from Arctic America and Russia and non-Arctic China and France. His address marked the first time a senior EU official has taken part in the gathering. Befitting a good Eurocrat, his speech stirred no passions. The addresses of his subordinates today can be expected to follow suit: For Brussels, what is called for right now is to send a reminder to others that it already is present in the region, rather than a rousing vision for its future. Rattling off a full list of Brussels’ contributions would take time: Since 2014, Brussels has funded more than 50 Arctic-related projects to the tune of over €180 million ($208 million). During Arctic Circle, discussion of its role has been limited to its two panels dealing with climate research and its space programs. Other areas, such as security, cannot be calculated in money terms, but EU officials feel they can contribute here, too. Touting its merits, say EU watchers, is out of character for Brussels, but that is something that needs to change if it is to get the word out about the things it does, reckons Marie-Anne Coninsx, the EU’s Arctic ambassador and its representative in the Arctic Council, where it has observer status. “The EU is not good at explaining what we do. Until this year, for example, the EU has had zero representation during Arctic Circle, despite the fact that the EU is a part of the Arctic,” she says. Geographically, the connection is matter of fact: Finland and Sweden have territory above the Arctic Circle. Norway and Iceland, she notes, follow the EU’s lead on most legislation. Greenland, meanwhile, has a lucrative partnership agreement with Brussels. Despite Moscow blocking the EU’s most recent effort to become a full observer (a move it made in retaliation for the EU placing sanctions on Russia in 2014 after it annexed Crimea), Coninsx does not feel the EU is hindered from participating in the work of the council in the same way other observers so. “The EU is an observer. Until Russia changes its position, our status as ad hoc observer will not change, but we are an observer,” she says. Neither is it prevented from playing a role in the Arctic outside the Arctic Council: It was one of 10 signatories to an agreement that temporarily bans fishing in the central part of the Arctic Ocean, and, after participating in a major Arctic science meeting in Washington in 2016, it will co-host the second, together with Germany and Finland, next week. All of this comes as Brussels is continuing to refine its position toward the region. Its Arctic policy, published in 2016, calls on the union to gather the input of Arctic residents and to use it as the foundation for its decisions about where to put future funding. The result was a decision to prioritize three areas: telecoms infrastructure, efforts to limit the effects of global warming and expanding European satellite capacity, in the hopes that it can improve services like search-and-rescue, ship-routing, iceberg detection and climate monitoring. Coninsx suggests that other areas where the the EU has a role to play are things like security, shipping and energy, given that all three affect EU residents, and can benefit from Brussels’ penchant for coming up with regulations. Brussels walks the walk. It appears that it also talks the talk, too.